Can I swallow saliva when using the whitening strips? Yes, you can. It is perfectly safe to swallow saliva when using the whitening strips. You may also notice a foaming reaction as the hydrogen peroxide gets to work, this is normal. Can the whitening strips be in contact with my gums? Yes, but such contact should be minimised to avoid gum irritation. What if I experience tooth sensitivity or gum irritation? It is not uncommon to experience tooth sensitivity and / or gum irritation whilst whitening your teeth. This is temporary and NOT harmful. To alleviate symptoms it may be sensible to whiten your teeth on alternate days, until you have used all of the strips. If the problem persists, discontinue use and consult your dentist. White spots sometimes appear on my teeth after whitening, should I be concerned? No. These white spots are temporary; they are not harmful and will disappear within 24 hours. Should I brush my teeth before / after use? Ideally your teeth should be clean when applying the whitening strips. However, do not use immediately after brushing your teeth because brushing can cause gum irritation. You may brush your teeth after use to remove any residue from the strips. Why is this product only available through my dentist? 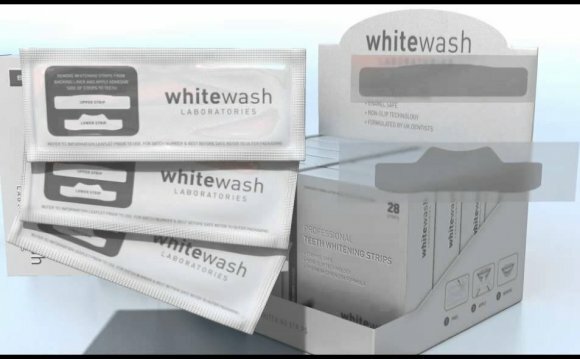 WhiteWash Professional Whitening Strips are only available on prescription from your dentist because your teeth need to be examined to ensure they are suitable for whitening. Whitening strips are not a substitute for regular dental care. Are whitening strips suitable for everyone? Though the whitening strips are non-harmful to the human body, it is advised that children under the age of 16 (18 in the European Union due to this being a legal requirement), pregnant women, and those sensitive to hydrogen peroxide should not use them. Patients with teeth sensitive to cold, heat or acid, or those who suffer from oral ulceration should discuss this with their prescribing dentist before undergoing a course of whitening treatment. Will the strips affect my dental work? The whitening strips will ONLY whiten natural teeth; they will not affect caps, crowns, veneers, bridges, fillings or dentures. Do not use on loose teeth, temporary fillings or Orthodontic appliances. Consult your dentist if you have any dental concerns. After using the strips for 3 days you will start to notice your teeth become lighter. For best results finish your prescribed course of treatment. Will I get even results? Each strip contains the exact amount of whitening gel to effectively whiten your teeth. Each strip should be positioned across the teeth and gently pressed into place, aiming to get maximum contact with all of your visible teeth. This will ensure even spread of the whitening gel. This depends on personal dietary and smoking habits. After the use of whitening strips your teeth will gradually discolour. To keep your whiter smile for longer it is best to avoid smoking and consuming foods / drinks that stain your teeth e.g strong coloured foods / red wine / coffee etc. To maintain your white smile it is advised to use one box of WhiteWash Professional Whitening Strips every 6-12 months, or use 1-2 strips on a monthly basis. How do whitening strips differ from trays? As well as being more cost-effective than trays, WhiteWash Professional Whitening Strips are more comfortable, less bulky, and allow you to whiten on the go. Whats more, each strip already contains the optimum amount of whitening gel so its less hassle for you and helps to ensure you achieve an even white smile. Why can't I buy teeth whitening gel online? The active ingredient in teeth whitening gel is hydrogen peroxide, which is a safe and effective means of whitening your teeth, however In the UK and throughout Europe it can only be purchased from a dentist for use under their direct supervision. This is because before undertaking any form of whitening treatment it is essential that you have a full dental examination to ensure it is safe and you have no contraindications to having your teeth whitened. Ideally your teeth should be clean when applying the teeth whitening gel. However, do not use immediately after brushing your teeth because brushing can cause gum irritation. You may brush your teeth after use to remove any residual gel left on your teeth. Why should I use an electric toothbrush? The key to good brushing is gently brushing for a long enough period of time and systemically cleaning the inside and outside of all of your teeth. This is where electric toothbrushes have an advantage over manual toothbrushes. All good electric toothbrushes should have a built in 2 minute auto-timer to ensure dentist recommended brushing time and some also include a 30 second interval timer so you know when to move onto the next section of your mouth. This timer is invaluable in ensuring that you brush for long enough because studies have shown that the average time spent brushing with a manual brush is 40 – 50 seconds which simply isn’t sufficient. A sonic toothbrush is an electric toothbrush which is powered by a system that causes the toothbrush bristles to move laterally from side-to-side producing sonic vibrations.